If you are also a little bit like myself and would like to do something good for yourself while having the neverending lust for something sweet and good, I have an absolutely delicious and simple dessert recipe for you all! 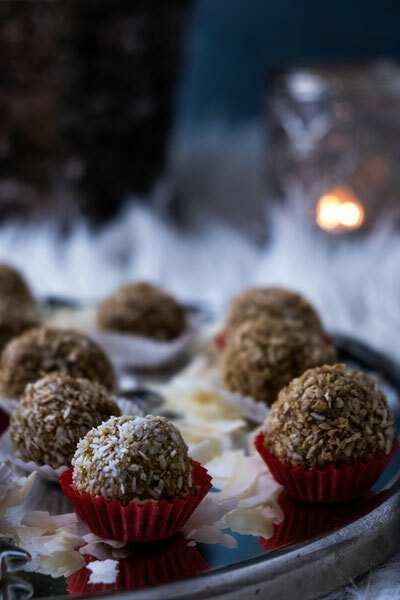 Low Carb Coconut Raffaelo Balls. YUMM! Place almond butter, cream coconut, coconut milk and vanilla pod seeds into a mixing bowl. Combine well. Put the mixture into the freezer for 20 minutes to acquire a firm mass. This will be great for making the raffaelo balls later. After 20 minutes take out your ready almond-coconut mass. Take little spoon (or in my case- I used a watermelon spoon) to scoop out a little ball where you press an almond or macadamia nut into it. Roll the almond-coconut ball in the "My Powerlogy" pistacchio cream and then cover in shredded coconut. Put on a tray or a plate and give it a good chill, at least 60 minutes. The raffaelo balls are the best to enjoy well chilled. After that, enjooooooy with a cup of coffee without any regrets! Have a wonderful year 2019!